This week's Next 20 community builder is Dr. Martine Reid. Martine is a published author, curator, and scholar in the field of Northwest Coast aesthetic anthropology. She was married to Bill Reid for 17 years before he passed away in 1998. Martine has devoted her life to fostering a greater understanding of Northwest Coast art and culture and was instrumental in the creation of the Bill Reid Gallery, located in downtown Vancouver—the only public gallery in Canada devoted to contemporary Aboriginal art. Creativity is a state of constant questioning. It is a way of thinking and a way of life that helps us find solutions to problems. It is a form of expression that reflects some concerns, some joys, some happiness, some way of life, some way of thinking. It's probing. It could be an explosion of joy or sadness. The value of creativity is to reveal or trigger our imaginations. Too much of the same thing inhibits creativity. 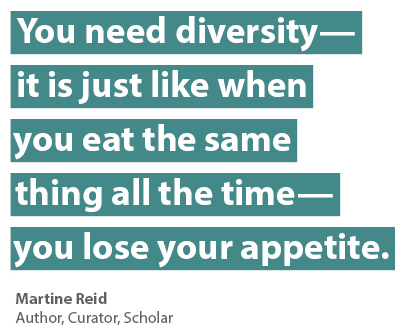 You need diversity—it is just like when you eat the same thing all the time—you lose your appetite. An authoritarian environment also stifles creativity. Luckily we live in a world where we are free to express ourselves. Getting up terribly early in the morning, this is when my creative juices are flowing. If I don't get my three to four hours of quiet time in the morning I become irritable. I need to read. I need to think. I need to listen to music quietly—my morning ritual inspires me to be more inquisitive and to think creatively. I find it difficult to be idle—my mind is always thinking and I keep myself busy whether it is reading, researching, or playing with ideas. Nature is very important to me. I cannot live without nature. What I like about nature is that it increases your curiosity—you ask questions about things as they unfold in front of you. I always look for the implicit and explicit meaning of things. So you probe things. Why do people do that? I always look for the meaning of things. My latest research project studies why people like the colour blue. I liked school very much. I remember when I was 11 or 12, one of my teachers gathered us all around at the end of the year and made predictions of what we would be when we grew up. When it came to my turn and my classmates asked, "What about Martine? What will she become? ", he answered, "She will have an extraordinary life." I clearly remember this and to this day I wonder if it has come true. Well, I certainly have had a life out of the ordinary. School is about acquiring knowledge, developing foundational skills, and building relationships with peers. School is also about offering possibilities to children—ideally a limitless realm of possibilities to allow children to explore their potential. I hope there will be some balance around the use of tools like the Internet. I feel it is important to take time away from these tools, because they are only tools—their addictive quality has the potential to stifle creativity. We know so little about the brain. Artificial intelligence is being developed without a full understanding of the brain's potential and while I admire the creativity involved in this work it sometimes looks like we are becoming more machine than human. Scientists think we will be immortal. For the sake of the Earth, I think we should not be immortal. I had a long walk along the Seine River that was full of second-hand stores. There was a book, very old, badly damaged. I opened this book and I said "wow". It was illustrated with a huge number of masked dancers of the Kwakwaka'wakw Indians. I was attracted to the Northwest Coast culture and decided to do my Masters in Anthropology. My curiosity—how people see the world and use their masks and dances intrigued me and brought me to the West Coast. Tell me about some of your most memorable professional moments. One of my proudest professional accomplishments is the creation of the Bill Reid Gallery in downtown Vancouver. It is the only public gallery in Canada that focuses on contemporary Northwest Coast Art.